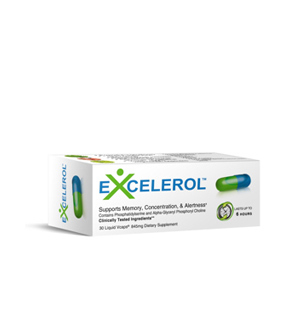 Excelerol is a popular cognitive enhancer that is available in Walgreens and online. This product contains premium nootropic ingredients found in quality brain supplements and performs well in customer reviews and our review at Smart Pill Guide. The ingredients, dosage & side effects should be considered when purchasing a brain supplement. This supplement does contain quality nootropic ingredients, but the manufacturer does not provide a complete list or information about the amount of each ingredient found in the pills. Instead, they refer to their “proprietary formula” on the product website and in advertising materials. The product contains vitamin B12, niacin, and the proprietary formula, which includes acetyl l-carnitine, DMAE, guarana extract, kola nut extract, bacopa monnieri extract, l-tyrosine, gingko biloba extract, green tea extract, rhodiola extract, tulsi extract, phosphatidylserine, white tea extract, black tea extract, vinpocetine, huperzine extract, citicoline, and alpha glycerlphosphorylcholine. The supplement is packaged in veggie caps, so it is suitable for vegetarians. Supplement manufacturers often list ingredients under a proprietary blend to protect their formulas, but it can limit the information available to the consumer. The effects of each ingredient may vary according to the dosage in the supplement, so it is helpful to know the amount of nootropic ingredients used in a supplement. Excelerol contains ingredients that are known to produce specific effects for memory and focus. For example, vinpocetine and huperzine A are known to work together to stimulate blood flow in the brain and increase electrical connectivity for better memory. Acetyl l-carnitine is an antioxidant that protects the brain cells and works together with gingko biloba to enhance memory and concentration. Clinical studies are another great indication about the quality of a product. The product website references studies conducted on ingredients contained in Excelerol, rather than on the product itself. Although there is evidence that some of these ingredients do provide cognitive enhancing benefits, there have been no clinical studies conducted specifically on this supplement. We tested this supplement for 45 days with volunteers ranging in age from 18 to 37. Participants took the supplements and returned to the lab every two weeks for general cognitive performance testing. The testing showed improvements in short term memory recall and reported improvements in remembering basic things on a daily basis. As participants continued to use the supplement, they began noticing improvements in long term memory. The results ranged among our volunteers, with some recalling vivid memories from a decade or more in the past and others enjoying enhanced memory and focus for college exams, projects, and presentations at work. Improvements in short term and long term memory were seen with continued use of the product. The feedback from our testing and customer reviews show Excelerol to be a well-rounded supplement for brain enhancement. In addition to memory and concentration, the supplement offers improvements for energy, mood, fatigue, focus, and problem solving ability. Compare this product to other reviews at Smart Pill Guide to find a quality supplement to provide the results you want.